Nine students currently studying for the priesthood in the diocese - one of the highest number in the country. Fr Ciaran Clarke (right) with Bishop Michael Smith and Fr Declan Kelly, also from the Diocese of Meath who was ordained a priest last Sunday. 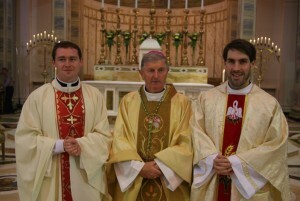 Fr Clarke was ordained on Sunday at the Cathedral of Christ the King, Mullingar. It is the second ordination in Meath diocese this month. 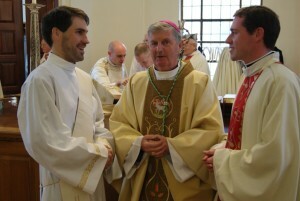 A sign of hope and a reason to celebrate was Bishop Michael Smith’s description of the ordination of Fr Ciaran Clarke in Mullingar cathedral on Sunday. Fr Clarke’s ordination follows just a week after the diocese celebrated the ordination of Fr Declan Kelly (26) in the cathedral last weekend. In his homily yesterday, Bishop Smith told the congregation of family, friends and well-wishers of the diocese’s newest priest that, “The Lord is always calling young men to be priests and Fr Ciaran is showing us that, in our own generation, parishes are continuing to provide examples of generosity and faith”. The 32-year-old priest hails from the parish of Dysart and he was joined in the ceremony by his parents Joe and Margaret Clarke, as well as over 50 priests and a large number of parishioners from Dysart and Mullingar. Fr Declan Kelly, who was ordained a priest for the Diocese of Meath last Sunday, also took part in the ceremony. Referring to the 75th anniversary of the Cathedral’s consecration, Bishop Smith noted that it was also 75 years since a priest from Dysart was ordained for the Diocese of Meath. The Bishop reflected on the Sunday’s Gospel, where saying ‘yes’ to God and putting ‘yes’ into practice is praised by Jesus as the right thing to do. Fr Clarke was an active member of his parish from a young age. He was an altar server in Dysart, where his mother is the church sacristan. He participated with the local ‘Lilliput Sports and Feis Committee’ which raised funds for the parish. The new priest has a keen interest in traditional Irish music and set dancing and became involved in Comhaltas Ceoltóirí Éireann (CCÉ), actively participating on the committee at local level and county level. After attending Mercy Secondary School, Kilbeggan, Fr Clarke completed a Post Leaving Cert course in Business Studies/Information Technology and pursued further studies for three years in Athlone Institute of Technology. It was during his college years that he first started discerning a vocation to priesthood before changing direction to working as a hospital clerk in the medical records department at St Francis Medical Centre, Ballinderry. He was accepted as a student for the Diocese of Meath and entered seminary in August 2007. Over the following years, Fr Clarke was assigned several parish placements in Mullingar, Trim and Tullamore. Fr Clarke celebrates his First Mass in St Patrick’s Church, Dysart on Monday 29 September at 7.30pm. Last week, Bishop Smith thanked the family of Fr Declan Kelly and his local community “for supporting his vocation”. In his homily, Bishop Michael Smith paid tribute to Fr Kelly’s deep faith, which enabled him to answer the Lord’s calling in a positive way. Deacon Rev Robert McGivney (27), who will become a priest in 2015, assisted in the ceremony. Fr Kelly commenced his studies for the priesthood in 2005 at St Patrick’s College, Maynooth. He undertook postgraduate studies at the Institut Catholique de Paris (2008-2009) before completing his theology degree while resident at the Pontifical Irish College, Rome. He has worked as a deacon in St Mary’s Parish, Navan since January 2014. The promotion of vocations to the priesthood has been a top priority for Bishop Smith and the Diocese of Meath currently has nine students for the priesthood, which is one of the highest number of vocations in the country. This includes Tony Sheridan (24) from Summerhill who began his seminary studies in Rome earlier this month.